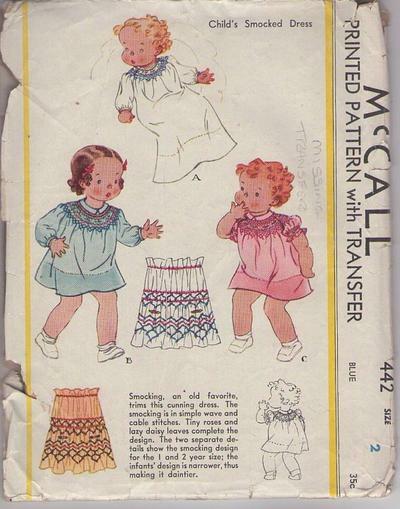 1936, 30s Childrens, Retro Toddler Clothing Patterns - Infant Smocking, an old favorite trims this cunning dress. The smocking is in simple wave and cable stitches. Tiny roses and lazy daisy leaves complete the design. The two separate details show the smocking design for the 1 and 2 year size; the infants design is narrower, thus making it daintier. CONDITION: This Original Vintage Sewing Pattern was cut & used. MISSING THE SMOCKING TRANSFER. All gown pieces appear to be complete and intact and have been neatly refolded with the original instructions. Envelope has edge wear.